This week, I am joined by Louie Cronin, author of the new book Everyone Loves You Back. 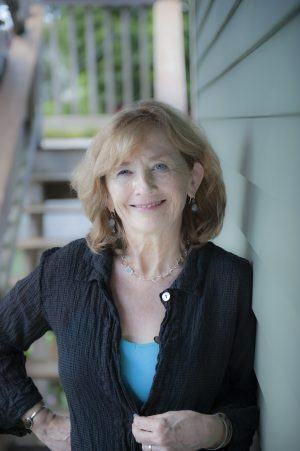 If you’re a fan of NPR’s “Car Talk,” Louie’s name might already be familiar to you, or perhaps you know of her from the many articles, essays, and short stories she has had published. I am delighted that Louie is visiting the blog this week to talk about her story and share some short excerpts from the book! As well as Louie’s guest post and the book quotes being shared today and Friday, there is also a $25 Amazon gift card giveaway. You can enter this below and share the feature daily for extra entries! Please continue to stop by throughout the week to find out more about Everyone Loves You Back and Louie Cronin! Bob Boland is surrounded. Yuppies everywhere. Goddamned professional women with their blunt cuts and power suits, their wimpy men, pale faced and narrow-shouldered, their PhDs, MDs and JDs on proud display in their book-lined studies. The neighborhood has always been full of snobs — half of it belongs to Harvard, the other half to Harvard professors, grads, and wannabes, the type who donate buildings and gymnasiums, who endow symphony chairs in perpetuity — but there used to be room for the little people, who deliver the mail, plow the driveways, clean the teeth, fix the burners. 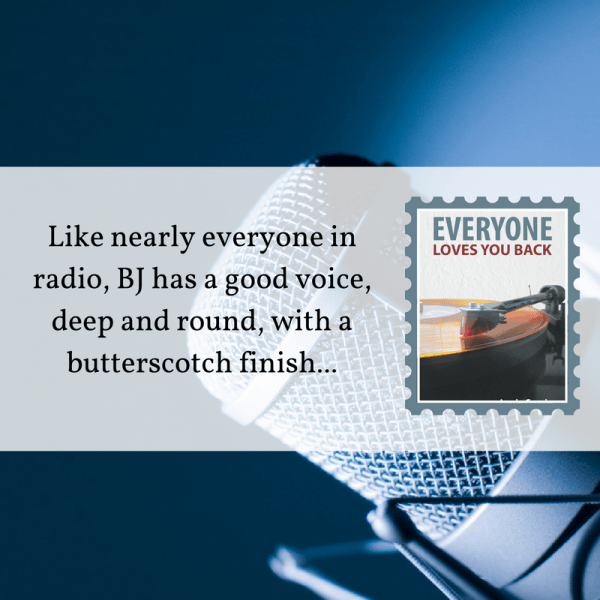 Like nearly everyone in radio, BJ has a good voice, deep and round, with a butterscotch finish; you picture James Earl Jones, maybe Gregory Peck in “To Kill a Mockingbird,” but what you get is a pale, fat, thirty-five-going-on-fifty-five, white guy who is obsessed with jazz. 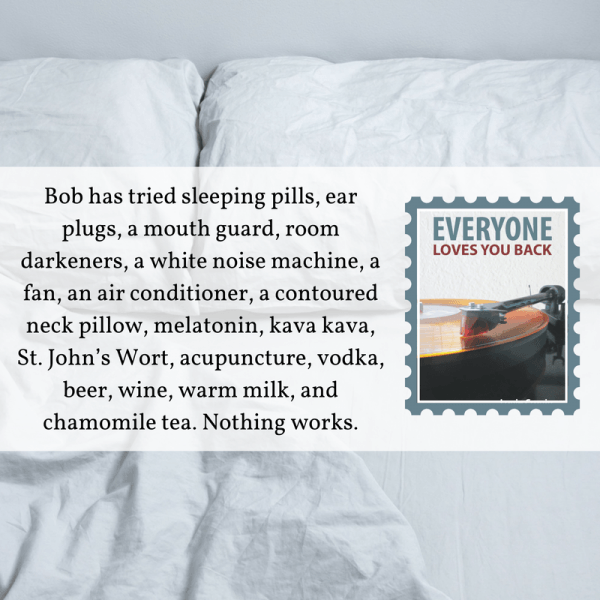 Bob has tried sleeping pills, ear plugs, a mouth guard, room darkeners, a white noise machine, a fan, an air conditioner, a contoured neck pillow, melatonin, kava kava, St. John’s Wort, acupuncture, vodka, beer, wine, warm milk, and chamomile tea. Nothing works. Irene turns on the lamp next to the couch, sits down beside him. He can smell her shampoo, something familiar and flowery. He can feel the warmth of her thigh through his jeans. He puts his head back. He feels sleep is close… he can stop worrying and let his mind drift over the day. Mabel. The botanist. The bandy legged judge. He feels a hand running up and down his thigh. “Jesus!” He bolts upright. 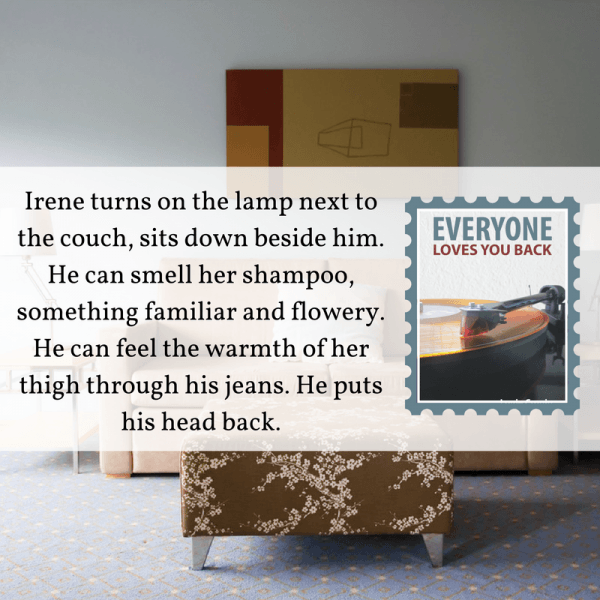 Coming soon: On Friday, Louie will be sharing some more quotes from Everyone Loves You Back. 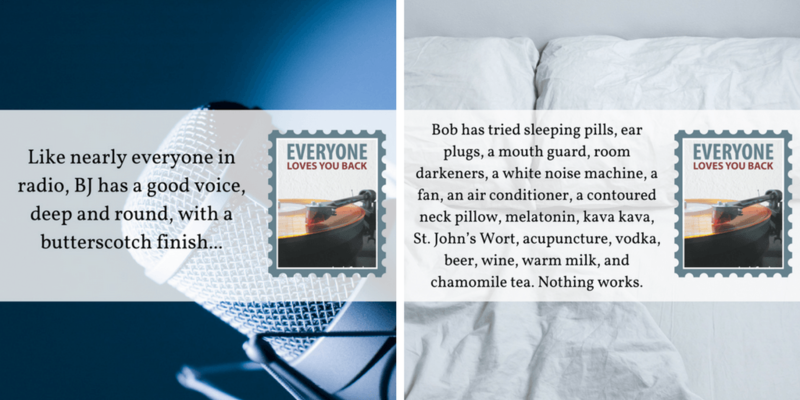 Louie Cronin, author of the novel Everyone Loves You Back, is a writer, radio producer and audio engineer. For ten years she served as NPR’s “Car Talk” traffic cop, producing the show and ensuring that every call was entertaining. 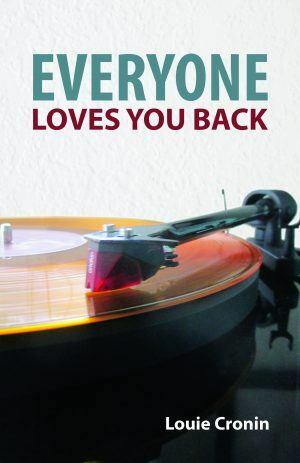 Everyone Loves You Back won the 2016 Molly Ivors Fiction Prize from Gorsky Press in LA, leading to the novel’s publication. A graduate of Boston University’s Masters program in Creative Writing and a past winner of the Ivan Gold Fiction Fellowship from the Writers’ Room of Boston, Louie has had her fiction and essays published in Compass Rose, The Princeton Arts Review, Long Island Newsday, The Boston Globe Magazine, and on PRI.org. Her short stories have been finalists for both Glimmer Train and New Millennium Writings awards. Louie has been awarded residencies at the Ragdale Foundation, the Virginia Center for the Arts, and the Vermont Studio Center. Currently she works as a technical director for PRIs The World and lives in Boston with her husband, the sculptor James Wright.